This is definitely one of my favorite YA fantasy series. It's so full of action and excitement. Sarah J. Maas is an excellent writer and I can't wait to see what happens in the rest of this series. I admit that, although I loved Celaena in Throne of Glass, she had a slight Mary-Sue (.i.e., she was too perfect) quality that bothered me a little. 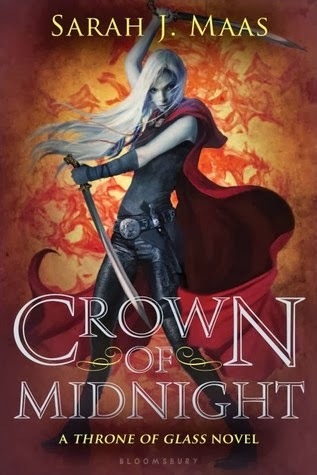 However, I think that in Crown of Midnight she was a much more well-developed character. Even though she was as tough as ever, she had flaws and weaknesses. I also love how Maas isn't afraid to make her heroine such a dark and twisted character. Celaena suffers so many losses in this book and it reflects on her character - she will stop at nothing to save what she holds dear. I also love how Chaol and Dorian aren't just in the story for the romance, too. Dorian really developed as a character and I love how he finally learns to stand up for himself. And Chaol is so sweet. I love how he's so loyal to his job and how he does what he believes is right no matter what. He sacrifices so much for Celaena. In my opinion, she totally does not deserve him. I just love the plot and the writing. There's so much action and lots of separate storylines happening. All the plot development has made me super excited for the next book. And the big reveal with Celaena at the end was amazing. I think I was biting my nails for at least the last 50 pages of the book! The writing is so good; I love how it's in third person and we also get the POVs of characters like Chaol, Dorian, and more - not just Celaena. It's perfect for epic fantasy books like this where there's always a lot of action. I'm so impressed with this sequel. It made me feel all the feels and I'm extremely envious of Sarah J. Maas and her amazing writing skills right now. I'm just going to sit in the corner and cry until the next book comes out. That's totally normal, right? Riiight?